Hurricane Harvey is Here! How can I help? First off, pray for those who are impacted by the hurricane, and pray for the first responders who will be onsite to help. 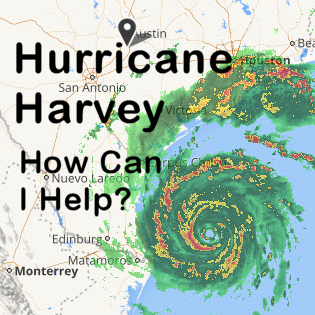 The very best thing you can do along with prayer is to donate to the Rio Texas Conference Disaster Relief Fund. Make your checks payable to FUMC Pflugerville and note in the memo line that the donation goes to RTD. You also can donate online at. Click the donate button below and select Rio Texas Disaster. I hope you'll make a special effort to be in church this Sunday, September 3. It's been a long week and we are going to reflect on our first 7 days of prayer in our 40 days of Prayer and fasting and we will onsider all of that in light of what God’s call to us is within the disaster areas of Texas. We will share communion together, we will pray for all and we will receive a special offering for disaster relief. Later in the day at 2:00 p.m. we will prepare Hygiene Kits for the effected areas. You are invited to bring items to go into those kits to church Sunday, the list is attached. Yes, it’s Labor Day Weekend, and if you are in town we are encouraging you to take an hour or so out of your weekend to pray and worship the God who restores and makes all things new. We will consider and commit to a faithful response to this heartbreaking disaster. If we haven’t seen you in a while, we can’t wait to see you. Hope you can make a way to join us! Please be in prayer for our friends along the Texas Coast. Pray for the First Responders and for the folks who will be helping with relief efforts. Pray for those who are evacuating and those inland communities as they may be dealing with flooding. Please keep an eye on our website as we will post ways that you and we can assist in the coming days. May God be with all who are in the path of Hurricane Harvey. ERT Training is scheduled for Saturday, September 2 in San Antonio - Click HERE to register. ERT Badge expired? Re-certify in 45 minutes by clicking HERE.